If I think about this episode using the least amount of brain possible, it wasn't bad. Not a ringing endorsement, I know, but a slight improvement on last week. Let's have at it, shall we? The camera opens on what looks like a younger version of Geri the Cleaner from Toy Story 2, magnifying lens attachment and all. He appears to be checking a man's dark blonde rumpled hair for ticks, but clarifies by announcing in Russian, "He's not concealing anything." (For those of us who need them, this portion of the program is helpfully subtitled.) Blondie's a prisoner, and one who has apparently escaped from other prisons before; here, his captors warn him, there will be no escape. After all, as the guard threateningly warns him, "Not even Gregor the Great can escape a bullet through the head." Blondie/Gregor smiles an awfully cocky "Я знаю, что вы не знаете," ("I know something you don't know") smile, then gets strapped in a straitjacket and locked in a cell. Dear Russian wardens: This is The Cape. Everyone has a crazy circus talent, and you just called him by the honorific "the Great." Do you really think a straitjacket will stay on him for long? The camera is above the action a little here, and the instant Gregor is alone, he looks up and smiles a funky smile, just so we can see the gap in his teeth on the top right side. 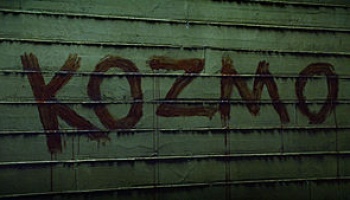 Oh, and before Gregor peaced out, he wrote KOZMO on the wall in big red letters, which must have taken a great deal of dead security guard blood. The moral of this story: Don't lock ex-circus folk up in straitjackets. You may as well just give them a sandwich and send them on their way. Phillips stops the car, but before he can open the door to confront his hop-on, his door snaps off. That's right: Snaps. As in, The Cape has used his titular cape to rip the door off of the car. Phillips is pissed that the Blue Book value on his vehicle has plummeted so quickly, and starts shooting at the doorsnatcher. As I watched The Cape shield himself from the bullets with the car door, I grudgingly acknowledged that it wasn't a bad idea to whip the door to himself for just such a purpose. All my grudges were gone, though, once The Cape begins his fighting banter: "I open the door for you and this is what I get?" He says it like he's so clever, poor thing. So this eponymous cape is handy for dangling people by their feet off overpasses, which is just what our hero proceeds to do. He's dangling with all his righteous Cape might, trying to get Phillips to come clean to everyone about the frame-up, but Phillips ain't talking, even when The Cape lets one foot go. The Cape gets very frustrated indeed, and drops the other foot. Phillips lands on a conveniently timed truck, and this is where the show got interesting.